Wed., Aug. 9, 2017, 6 a.m.
A civil rights complaint filed by a Michigan woman is prompting Spokane Public Schools to make its website accessible for users with disabilities. The complaint is one of more than 1,700 that education-activist Marcie Lipsitt has single-handedly filed nationwide in a year and a half blitz. Vivian Huschke, a vision rehab specialist for Spokane’s Lilac Services for the Blind, said the complaint, and the changes it will prompt, are necessary. “It’s one of those things that unless it’s brought to the surface change isn’t going to happen,” said Huschke, who is blind. While compliance with the Americans with Disabilities Act may most often be associated with building access and amenities, there’s much more. For websites to be ADA accessible, for example, they need to be navigable with a keyboard and compatible with speech recognition and screen reading software. On Tuesday, Huschke and her coworker Russell Smith, who is also blind, attempted to navigate Spokane Public Schools website using screen reading software. The home page was OK, Smith said. But as they went deeper into the site things were less accessible. Photos didn’t contain alternate text describing what was shown. The keyboard navigation would skip whole sections of the page. Huschke and Smith described it as similar to trying to navigate a room that was being constantly rearranged. And that’s why Lipsitt files the complaints. “People deserve accessibility,” she said. Lipsitt also has filed U.S. Department of Education Office for Civil Rights complaints against Gonzaga University, the Washington Office of Superintendent of Public Instruction, the Idaho Department of Education, the Washington State School for the Blind and Washington State University. Each complaint takes about 30 minutes to file. The complaints focus on the accessibility of the organizations’ websites for those with disabilities as outlined in the ADA. All of these institutions are in the process of making their websites ADA accessible. Lipsitt has filed newer complaints in Washington, however she declined to name which districts or schools are included. “There are some overly eager, unethical web designers and attorneys following my efforts and pouncing on these districts and colleges before they have been contacted by the (Office of Civil Rights),” she said in an email. The complaint against Spokane Public Schools was filed on March 31. On May 31 the complaint was closed after the district made a commitment to improve accessibility. However, the Office of Civil Rights will continue to monitor the implementation, according to a resolution letter sent to the district in May. 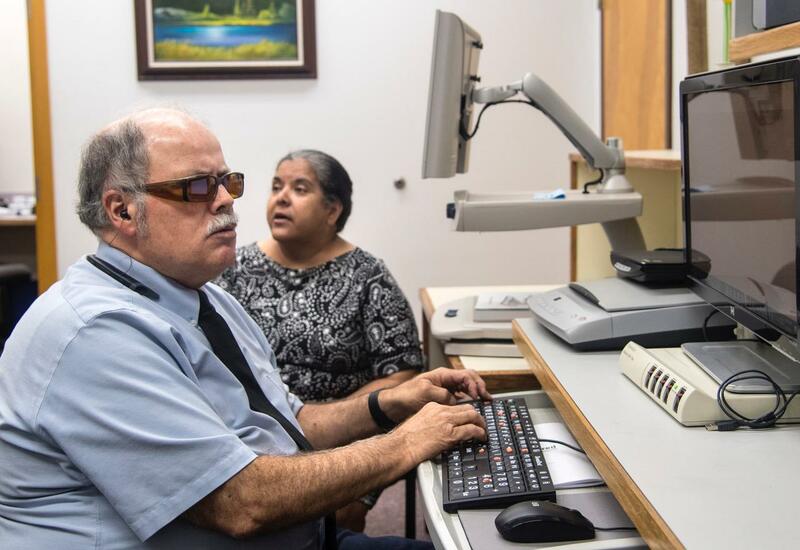 Nationwide the OCR is investigating 556 cases involving web accessibility, according to an Education Department spokesman. Jared Smith, the associate director for WebAIM, a Utah-based nonprofit dedicated to web accessibility, said the slough of complaints has made web accessibility a hot topic. However, there is a downside, he said. School officials may feel hurried or angry because of the OCR complaint. And that could lead to poor implementation. “Being forced into this sometimes doesn’t result in the best change,” he said. Although a federal regulation mandating accessibility has been in effect since 2001, the exact steps and requirements haven’t been clearly defined, Smith said. For the last eight years the Department of Justice has been working on a set of ADA specific web accessibility standards, he added. That would have clarified much of the confusion. However, this year that regulatory effort was put on the inactive actions list by President Donald Trump’s administration. That’s a problem, Smith said. “Right now when the OCR knocks on your door … it’s very reactionary as opposed to OK we have some clear guidance here,” he said. Smith recommends school districts or colleges draft an accessibility policy and have an implementation plan. That way if a complaint is filed they can show they’re making an effort. Part of the problem is the size and complexity of most school websites. For instance, there are about 13,000 individual pages on the Spokane Public Schools district website. Morrison said the district planned to overhaul its website following an external audit of the district’s communication department, which found that the website was difficult to navigate, among other things. The audit also recommended the district hire a webmaster, which it plans to do. Prior to Lipsitt’s complaint, however, Morrison said ADA accessibility wasn’t “really on anybody’s radar.” The district hasn’t received any complaints other than Lipsitt’s. “I think that the end result is good,” he said. Part of the problem for Spokane, and for most school websites, is that a number of people are involved in the creation and posting of content, Morrison said. For instance, every elementary, middle and high school in Spokane has their own web page within the larger district website. At each school at least one, but often more, people are responsible for posting content. Creating a unified set of standards for such a system will be difficult, Morrison said. It requires the district not only redesign the website, but also retrain staff. Morrison estimates that just developing a plan to become ADA compatible will cost the district $25,000. “Anything we can do to make it easier for them to find content and information they need is going to be a plus,” he said. Although becoming ADA accessible is an expensive and complicated undertaking, Lipsitt doesn’t feel bad for the districts she files complaints against. “If these school districts had done it right the first time some of these wouldn’t be in this boat,” she said. Her advocacy work started small. As a parent of a child with special education needs she slowly learned the byzantine system of federal and state special education law. Now, she works full time as an advocate for Michigan families. Lipsitt filed her first ADA complaint in January 2016. For her, web accessibility is a matter of civil rights. Although the the U.S. Department of Education has indicated it will stop investigating many allegations of civil rights violations, Lipsitt hasn’t seen a slow down. In July, she received 57 resolution letters from the Department of Education. Smith was also happy to hear the Lipsitt filed a complaint. While he recognizes that it’s hard to keep ever-changing technology accessible, it’s a job that must be done. “It’s an on-going battle for accessibility,” he said. Published: Aug. 9, 2017, 6 a.m.